focus groups conducted with a diverse cross-section of students, Houghton Mifflin presents a groundbreaking solution for skills mastery, understanding, and retention. Feedback from students has been instrumental in all aspects of development--from design and pedagogy to testing and assessment to title and packaging. These elements culminate in a textbook program that reflects the way students learn and study best. 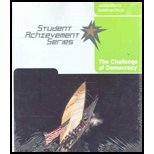 As with all texts in the Student Achievement Series, The Challenge of Democracy incorporates concise, to-the-point coverage; eliminates extraneous material; integrates pedagogy that reinforces key concepts; features a strong, supporting web component for review, testing, and assessment purposes; and provides students with real value for their educational dollar. Kenneth Janda works in American government, political parties, elementary statistics, and computer methods. His books include Political Parties: A Cross-National Survey, Parties and Their Environments: Limits to Reform?, and the American government textbook, The Challenge of Democracy. He cofounded and coedits the international journal, Party Politics. In 2000, he won a "Lifetime Achievement" award from the American Political Science Association for his research on political parties. In 2005, he was a co-winner of the APSA Award for Best Instructional Software, and in 2009 he received the APSA's Frank J. Goodnow Award for service to the profession.